Your humble Burger Boy interviewed on A Hamburger Today. Double Bacon Cheeseburger, $5.89. Fries $1.39. Formerly the Dairy Belle, this restaurant has changed its name to better reflect what they do. The place is clean and bright. 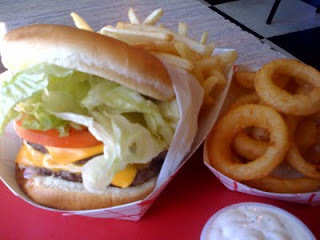 The double has two quarter-pound patties, American cheese, mayo, mustard, ketchup, onion, lettuce and tomato. The burger was served hot and fresh. The sesame bun was soft and tasty. The crisp bacon was placed between the two patties, a nice touch. Fries were thin, salty and fresh. 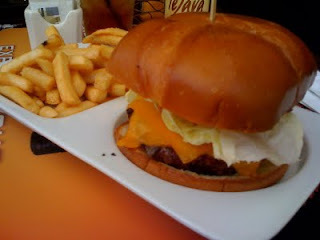 Overall, a nice classic burger. 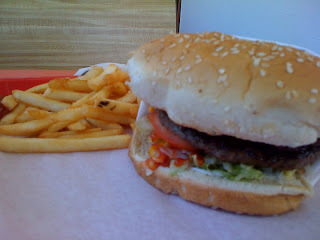 I had never had the burger at the BBC in Menlo Park before, but everyone had always told me it was very good. It is. The BBC Angus burger is made from free-range, hormone-free beef, impressive brioche bun, tomato aioli, red onion, tomato and pickle. I thought the burger pattry itself was fresh and tasty. it was cooked just right. The "secret sauce" style aioli made a nive addition to the whole thing. The fries were medium cut, hot and tasty. The outdoor setting near Cafe Barrone pleasantly added to the mix.